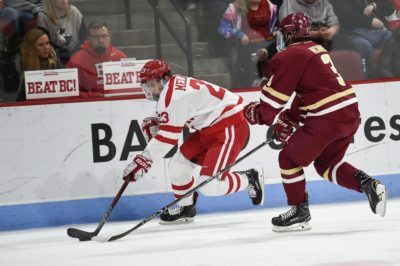 Boston University men’s hockey graduate transfer forward Drew Melanson entered his stay on Commonwealth Ave. amidst plenty of uncertainty. After Melanson spent the first three seasons of his career at Rensselaer Polytechnic Institute, Terriers (7-10-1, 5-6-1 Hockey East) fans were unsure of just where he would fit in on the line chart. Eighteen games in, it is evident that Melanson belongs on the team’s top line. The Paramus, New Jersey native played a role in each of BU’s goals in Friday’s 3-2 loss to University of Massachusetts Lowell. He was on the ice as the Terriers hit the score sheet immediately out of the gate when freshman forward Brady Tkachuk scored off assists from junior forward Jordan Greenway and freshman defenseman Cam Crotty 42 seconds into the game. The game only got sweeter for Melanson in the following period. Playing a man-up at the beginning of the period, BU found paydirt just 36 seconds in. Sophomore defenseman Chad Krys found Greenway in a transition situation. Greenway dropped off a pass for Melanson, who ripped it past Lowell (9-7, 6-5 Hockey East) goaltender Christoffer Hernberg for his first goal as a Terrier. Melanson also tied for second on the team in shots with three. One of those shots came at the beginning of the third period, when he finished off a penalty kill by stripping the River Hawks’ sophomore forward Kenny Hausinger of the puck. After the defensive maneuver, Melanson skated untouched down the left side of the ice and released a rip on Hernberg which could have resulted in another goal. Considering Melanson notched 17 goals in his time at Rensselaer, it was a little odd seeing him go scoreless for the same amount of games in his first year at BU. It was a process for Melanson to work his way up to the Terriers’ first line. Melanson first carved out his niche on the third line alongside sophomore forward Patrick Curry and freshman forward Ty Amonte in the month of October. He netted his first point of the season in the Terriers’ near comeback in a 4-3 loss to then-No. 1 University of Denver on Oct. 27. With BU trailing 2-0 in the contest, Melanson garnered an assist on Amonte’s first career goal. The tally was the result of budding chemistry on the third line, as the trio excelled with fluid passing leading to numerous shots on goal. When the Terriers visited Madison Square Garden for a bout against then-No. 7 Cornell University, Melanson found himself on the fourth forward line alongside senior forward Nikolas Olsson. However, Melanson’s role changed a week later at Boston College, where he moved up to the top line for the inaugural time this season. Starting alongside Tkachuk and Greenway, Melanson did not disappoint, notching a positive plus-minus rating while the Terriers exploded for a 7-4 upset win at Conte Forum. Melanson assisted on a critical insurance goal for BU in the second period, as he and Tkachuk found senior defenseman Brandon Hickey who scored to put the team up by an insurmountable 5-3 margin. The next night, Melanson was on the first line, and the trend continued into Friday night’s tilt against the River Hawks. Melanson managed to put a number under the goal column for the first time as a Terrier, something which will result in him seeing more opportunities alongside Tkachuk and Greenway as the in the series finale against Lowell.